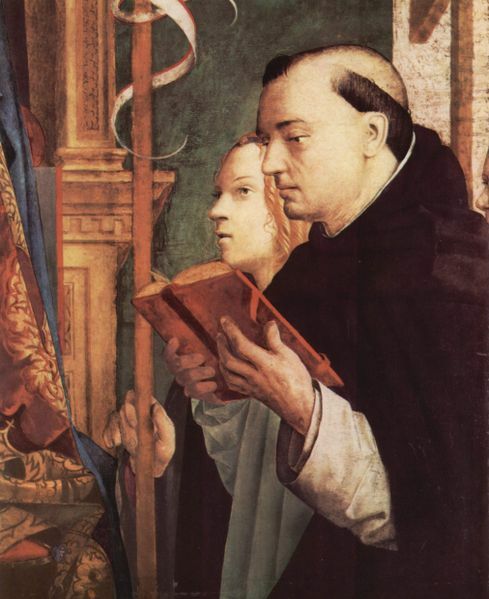 S T. DOMINIC was born in Spain, in 1170. As a student, he sold his books to feed the poor in a famine, and offered himself in ransom for a slave. At the age of twenty-five he became superior of the Canons Regular of Osma, and accompanied his Bishop to France. There his heart was well-nigh broken by the ravages of the Albigenian heresy, and his life was henceforth devoted to the conversion of heretics and the defence of the Faith. For this end he established his threefold religious Order. The convent for nuns was founded first, to rescue young girls from heresy and crime. Then a company of apostolic men gathered around him, and became the Order of Friar Preachers. Lastly came the Tertiaries, persons of both sexes living in the world. God blessed the new Order, and France, Italy, Spain, and England welcomed the Preaching Friars. Our Lady took them under her special protection, and whispered to St. Dominic as he preached. It was in 1208, while St. Dominic knelt in the little chapel of Notre Dame de la Prouille, and implored the great Mother of God to save the Church, that Our Lady appeared to him, gave him the Rosary, and bade him go forth and preach. Beads in hand, he revived the courage of the Catholic troops, led them to victory against overwhelming numbers, and finally crushed the heresy. His nights were spent in prayer; and, though pure as a virgin, thrice before morning broke he scourged himself to blood. His words rescued countless souls, and three times raised the dead to life. At length, on August 6, 1221, at the age of fifty-one, he gave up his soul to God.